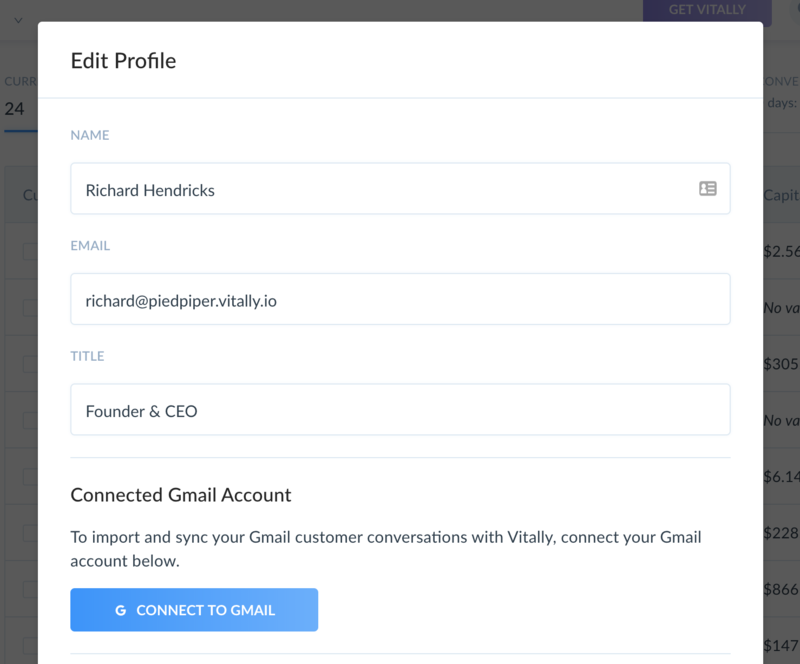 Vitally's native integration to Gmail allows you to automatically track email threads with customers as conversations in Vitally. Let's see how that works! In order to give Vitally access to emails in your Gmail account, you'll need to enable the Gmail integration in the Profile Settings for your Vitally account. Your Profile Settings are accessible via the dropdown menu in the top right. You'll be guided through an authentication process, which will grant access to Vitally to read your Gmail conversations. Vitally requests as little/restricted access to your Gmail account as possible - our access to your Gmail account is read-only. Note: Since each Vitally profile can only link to one Gmail account, you'll need to ensure all your team members 1) have a Vitally account and 2) connect their Vitally account to their Gmail account (via the above process) to ensure you track as many customer conversations as possible in Vitally. We'll import your most recent Gmail conversations on initial connection: Once you connect your Gmail account, we'll kick off a historical import to grab your most recent customer emails and sync those into Vitally. We'll listen for new emails moving forward: Vitally uses Gmail webhooks to listen for new emails sent to or from customers. Once we receive a notification from Gmail for a new email, we look through the to and from fields on the email to try and locate a user at one of your customers with that email. If one is found, we'll add the message to Vitally associated to that user, as well as any other users or team members also found in the email. If you'd like to disconnect your Gmail account from your Vitally account, simply follow the steps listed above for enabling the integration. Once you connect your Gmail account, the Connect to Gmail button changes to a Disconnect from Gmail button that will revoke our access to your Gmail account.